The Emily Stationary Living Room Group by Broyhill Furniture at AHFA in the area. Product availability may vary. Contact us for the most current availability on this product. 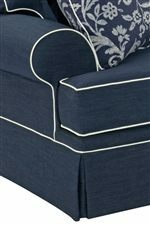 Arm Type Rolled Arm with welt cord trim.